Denise Drysdale is TV Royalty! Melbourne born Ding Dong began her showbiz career as a three year old dancing in pantomimes. At 14, Denise – just 157 cms tall – joined the GTV9 Ballet on In Melbourne Tonight with Graham Kennedy. As well as appearing on The Ernie Sigley Show twice weekly throughout 1975, Denise also appeared on The Norman Gunston Show, Celebrity Squares, Young Talent Time, Countdown, Division Four, Homicide and Bellbird. Denise and Ernie also recorded ‘Hey Paula’ in 1975, which went Gold, selling more than 100,000 copies. 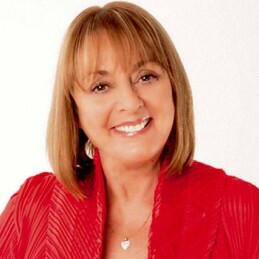 The regular TV exposure thrust her into the limelight and Denise won the TV Week Gold Logie for the most popular Female Personality on Australian TV in both 1975 and 1976. In 1983, aged 35, Denise spent two years in Sydney doing Weekend Magazine and later Beauty & the Beast. In 1989 Denise again teamed up with long time friend Ernie Sigley to host In Melbourne Today, and in 1991 began a Sydney version of the show, In Sydney Today. Denise Drysdale joined IMT as Frank Holden’s zany off-sider when she returned to Nine in 1996. 1997 saw Denise’s career highlighted in This Is Your Life and in 1998 she joined the Seven Network to present her own TV show – simply called Denise – for the first time in her career. The year 2000 saw Denise celebrate 40 years in the television industry and after 52 years of working non-stop, Denise has decided to take a break from her TV commitments, most recently as a regular on Channel Ten’s The Circle for two years. Today Denise is in demand as an MC for corporate award events, Morning melody shows and trade shows.